41 Degrees (Celsius) on my 25th Birthday! I think everyone in Melbourne melted just a bit yesterday! Just a bit! Wednesday I got my Driver’s Licence so I was ready for my birthday! I can’t imagine how things would have been if I hadn’t achieved this… but I think that’s why I planned it that way. No excuses this time! Yesterday, was a very big day for me. I awoke with a pain in my stomach at 5:30am. I wasn’t sure why my tummy was bothering me because I hadn’t felt like this for a long time. I thought that figuring things out with my Gluten Free diet would mean that I wouldn’t suffer anymore… but maybe it was just stress. This time of the year can be stressful for most anyone. Anyone that is an adult that is. For the kids, it’s fun, full of gifts and extra family time. Children love this time time of the year. With the thought of Santa Claus bringing them presents and decorating a Christmas tree… how can it not be anything but joyful! I think that most Christmas’ from the age of 3 right up until 19 I loved Christmas. I was a child amongst the rest who got excited, who gave cards to all my friends, who loved decorating our Christmas tree. From about the age of 20 things started to change. I don’t think my Christmas spirit has completely gone but I think until I have children of my own it will feel slightly different. Not only have I been growing up in this time but I have had a lot to deal with. I have learnt that Christmas can mean both joy and sadness for some. For a while it was hard to accept. How can something that was once so special change so dramatically? I remember seeing this in adults when I was a child and thought it wouldn’t happen to me because that was how much I loved it. But it’s ok now because I feel so much different. I can still see the great things about Christmas and my Birthday. My day finished yesterday with my creative writing class. They sang me Happy Birthday and we had a great time laughing, chatting and working on our writing. I climbed into bed… trying very hard to wait up for my Mum who was driving back from my grandparent’s farm… she didn’t make it until 11:30pm. With half an hour left of my Birthday. I got to see her and have a hug! I am not too old to want a hug from my Mum or at least on my Birthday! It was a big long HOT day and I would have preferred for it to be a lot cooler. But it was still a good day. Filled with lovely people, lots of smiles, laughter and best wishes for turning 25! Yay for getting another year older! I hope that all of Melbourne didn’t melt away yesterday and are enjoying a much cooler day today. If I don’t get a chance to pop by my blog on the 25th of December – then I hope everyone has a very Merry Christmas and a Happy New Year for 2014! She did not get “Friends” straight away. As I think about the past year and being persistent with pursuing my teaching career. I think about how positive thinking has taken on many forms. It has not always come easy. In fact to think positively is one of the hardest things I have ever had to do. It is not natural when you are feeling down, frustrated, angry and disappointed in life to change those thoughts into something positive. But if you don’t life inevitably becomes almost impossible to live. Difficult life situations although hidden by being hard to deal with can actually become things that are good in life. Because we learn from them. I know one day I will look back on today. I will look back on the time that I am in now trying to figure it all out and I will think about how far I have come. I know this to be true because I have already experienced this feeling. I have already reflected on life events that happened once upon a time. Knowing this to be true is one of the many reasons why I keep going. I am happy for those people who got teaching jobs last year and thanks to social media I have become aware of roughly how many but also roughly how many who didn’t. Some of these people who went on to get jobs have also been complaining about the work load. It is a double edged sword to achieve what you want. To those people who have full time teaching jobs, I urge you to not complain. Because out of thousands of graduates you were chosen. You were hired as a teacher. Instead maybe you think of your peers who don’t have teaching work. How would you feel if you were them? On the other side of happiness there comes a little bit of sadness. For those graduates who are still searching. Some of these people are not just searching for teaching roles. They are trying to still live lives despite not having what they worked so very hard for. Yet they are still going. Because they think about how great it is going to be when they get there. I think although it has become harder for me and the thousands still looking we are the ones that will appreciate it more. Lisa Kudrow was the commencement speaker at the graduation ceremony for Vassar College in 2010. I watched her speech this morning via YouTube. She graduated from Vassa with a BA in Biology in 1985. She did not get her role as Phobe Buffay on “Friends” until 1994. She first had to make the decision to pursue a different career than what she studied in and then she had to overcome many obstacles before landing her first ‘real’ job. Two things that stood out from this speech for me is how she said that your 20s are a series of different crossroads and that after being fired from “Frasier”(another TV show…) she still managed to get up in the morning. That if she was able to simply get up each day, leave her apartment and still live her life. She was coping really well. “Friends” changed her life. It didn’t happen straight away. One day I will know of a similar feeling. My life will be changed somehow. It hasn’t happened just yet. But it will, I know it will. If you are someone who is still searching for this same feeling, for this same change…then that is ok because your ‘one day’ will happen, just you wait and see. Here is the link to Lisa’s speech. I have given myself a project… to find out as much as I can about Mary Poppins and her creator P.L.Travers. There is now a movie coming out called “Saving Mr.Banks” which is about how Walt Disney fought with P.L.Travers over making the books into a film. Mr Disney is played by Tom Hanks and Mrs Travers is played by Emma Thompson. I love Emma Thompson and I believe that she fits the role perfectly!! I am so excited! It looks so bloody brilliant. I must, I must see it!!! I love Mary Poppins! I have seen the movie probably a million times and watched the stage show… but never have I ever read the books. Up until now that is! 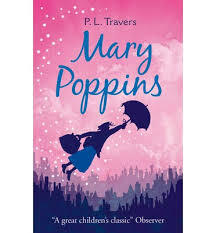 I read the first Mary Poppins book by P. L. Travers just recently. Because lets face it, if I were to be a fan I had to read the books too. But let me tell you… The movie version is almost nothing like the book. It is written by P. L. Travers who although was born in Australia but considers herself to be British. You can understand the British tone to the story and the fact that a family would live they way they did in this story even though they aren’t terribly well off – a very British tradition. But the world that she writes… is very bizarre, very strange and most definitely influenced by drugs – that’s for sure! It is more like a series of short stories that one story as there isn’t much of a flow or a link between chapters. It is very enjoyable and I can see why Disney wanted to make a film of it… but I can also see why they chose to tone it down a bit. There are just a bit too many unusual things happening… having said that, it is Disney and they liked presenting a more innocent picture of the world to their young audiences. Which I guess does make sense. The main changes to the books are the fact that the story isn’t told through song, the Banks family have four children Jane and Micheal who appear in the movie as well as two babies John and Barbara… Mary sleeps with the babies in the book instead of having a room adjacent to the children in their nursery, that there are more household staff in their house and that Mary herself isn’t as likable. That was probably the crushing part of the book and being a huge fan of Julie Andrews and her version in the movie… that the book version although the children liked and eventually loved her was sometimes quite rude even towards the parents, held a few secrets close to her and could seem a little harsh towards the children. Plus she taught the children ‘lessons’ in odd ways. She is also described as not being that pretty. I am curious to read other Mary Poppins books just to see where the story goes and to figure out where other parts of the movie come from as well as the stage show. If you are like me and wanted to know more about the world of Mary Poppins this is something you should read – it is indeed a great story even if a bit odd. If however you don’t want the Julie Andrews image of Mary Poppins to be in some way tainted… then I would stay away because it will change! For anyone else who hasn’t actually seen or read Mary Poppins then well – what are you waiting for?? Signing off… hope everyone is having a good week! Once upon a time I remember not really liking Jamie Oliver… I cannot remember why I just didn’t. There are a few reasons that I can think of now that might have been why… like a silly one being that so many other people liked him and therefore I decided not to… or simply because I wasn’t all that interested in cooking and didn’t need a reason to be interested in him. I think when I started liking him was when he started his healthy school dinner projects in England. He has such a passion for food that when it came for him to teach children about it he became a naturally good teacher. He didn’t go into to schools and got children to follow recipes, take notes from the board, gave them rote learning exercises, etc. He got the children involved in not just the cooking of the food, but in what types of food are good for us and how they can become delicious. From there he went into people’s homes and talked to the parents about why their children were eating unhealthily and how they could make changes in their cooking. I remember that something he was teaching was learning a ‘set’ of recipes maybe about ten that you know off by heart, that will keep you and the family happy, that are affordable and most importantly – healthy. Unfortunately, arriving at my new home some of these ideas I had for cooking great food…came crashing down as soon as I saw the state of the kitchens…hmmm hundreds of young students sharing kitchens together isn’t always a good idea… just maybe… I learnt to be a bit more resourceful with my cooking… but it was not quite the same. The year after I had almost the opposite experience. Boarding with family friends who cooked for me and not just simple basic meals either… I’m talking about barley and lamb shank cassroles, middle eastern feasts, yummy soups, chocolate puddings, apple cakes, roasts, etc, etc… just really good food! I was never hungry! But then the year after that, I was living in a share house and diagnosed with Coeliac Disease. Not only was I cooking for myself again, but I had to figure out what on earth I was going to make that was Gluten Free. I had to enjoy it and try and put on weight, healthily. I was hungry all the time and just could not work out how to be full. Last year came and things started to improve… I was cooking pretty decent meals, all gluten free, healthy, filling and great tasting. But I was wasting lots because I did not know what to do with it. I have have since resigned from my job to get back into focusing on teaching and with more time comes better cooking. I have decided to shop at the market, try out lots of different recipes, transform ones with gluten to make gluten free and cook from recipes that are already gluten free. On top of which I have been watching Jamie’s show “Save with Jamie” and it has really inspired me to be aware of not just how to stretch money when cooking but on how not to waste so much food. The show is really upbeat and it looks like most his recipes are doable. Maybe not in his style, with his perfectly stocked pantry or team of cooks… but it actually looks realistic. It’s just a great show and is making me just want to cook and eat well! Are we in fear of turning 25? I’ve decided to join those who write about what it’s like to turn 25. I’m about 4 months off from doing so and I’m not in fear as though this age means I’m getting “old”… I’m actually really excited. It does mean that I will be a quarter of a century old… it does mean I’ll be half way to 50. I can no longer be considered “youth”…. young yes… totally and completely young. Other people who I have known that have got to this age have said that it makes them feel old. I do not really understand that sorry. Even with a housemate of mine turning 30 and saying the same thing… It’s not old. Old to me is where you’re wrinkly all over, have grey hair, need help with getting on the bus and can no longer remember your grandkids. Before that we’re young. Even my mother whose age I will not reveal, to me is young. For those of you who know me and know me well, know that I have well and truly been affected by life. I have learnt a lot from life. I have learnt that life comes with its ups and downs. I have learnt a lot about people. That we are all human trying to get along. I have learnt a lot about babies and children. That they need love, stability and a place where they can belong. I have learnt a lot from my friendships. Friends sometimes come and go… I will always remember who you are even if in years to come we do not see each other. I have learnt that family are not the people we choose to belong to but that I will always love them and stick by them – unconditionally. I have learnt that at 18 although legally I was an adult… that really I was sill a teenager and that I am still learning about what it is to be an adult and will probably still be learning about that at age 80, just like I know my grandparents are. I have learnt that the plan I had at age of five to be a teacher and a mother doesn’t necessarily have to be stuck to and that, that is ok.
To me I choose to enjoy getting older. Learning more from life. Getting what I want from this life that I have. Be grateful that I am alive to live it. Hopefully I will learn about what it is to “stress less”, to be a happy with what I have… not always wanting the new… staying healthy without the pressure of being “skinny”… travelling to other parts of Australia and the world that I haven’t seen… and to be open to every new challenge that comes my way. I have stopped and thought about this post many times. What did I want to say? What will I end up writing? Will this have an effect on how people who know me in the outside world see me and who I am? I feel both apprehensive and positive about writing on this subject. I remember wanting to write a post after watching the first episode. I noticed myself being very quick to judge and criticise the characters that we as the audience barely knew. It was only episode one! I thought ok… maybe I need to watch another episode before I start writing about it… However, as the weeks went on. I realised that I couldn’t work out how I felt or thought about these people. My secret favourite was Bernadette (Justine Clarke)… she had the clothes I liked, gorgeous twin girls, I loved her approach to “step-parenting”, she had a good job… she just had a warmth about her – there was an immediate liking to her. 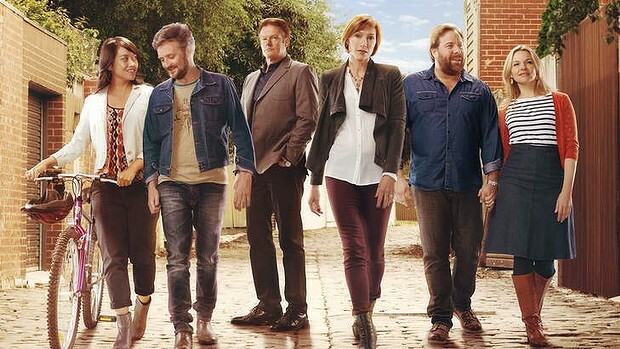 My least favourite in the beginning was Caroline (Claudia Karvan)… a completely different person to Bernadette. I didn’t feel an instant liking to her… because I wasn’t sure about her parenting or choice in the name Carmody… I felt disconnected to her as a person. I started to see myself agree with her husband. Now I wish that I could go back to that first episode and take back what I was thinking. I am generally speaking not that type of person. I like to see people for who they are. I like to see that we are all human beings, that we may have different lives, different ideas on how to live… that there is no “right” or “wrong” way of going about things. I don’t look at people and judge them. It’s just not me. I don’t believe it is up to me to do so. What right do I have? Even with family and friends that I’ve known for years. It’s not my life. At the end of day they are the people who have to live their lives the way they choose to. Or in the case of this TV show… the way the writers decide their character’s lives. With this in mind. I now see this show with very different eyes. I see all the characters, their struggles, their triumphs, their bad days, good days, the decisions they are making, how all of this affects them, the people around them and how their lives unfold. I can see the human side to all of them. I can see that the writers of this show have taken good care in giving us a broad picture of Australian life as it is today. There is no set path to everyone. I can see why some people will choose to relate to some of the characters more than others and I can understand why some will be liked more than others. I am hooked on another great Australian Drama and lovin’ it!! Are we having the time of our lives? I can only speak for myself… really. Signing off… because there is a cat here in desperate need of my attention!